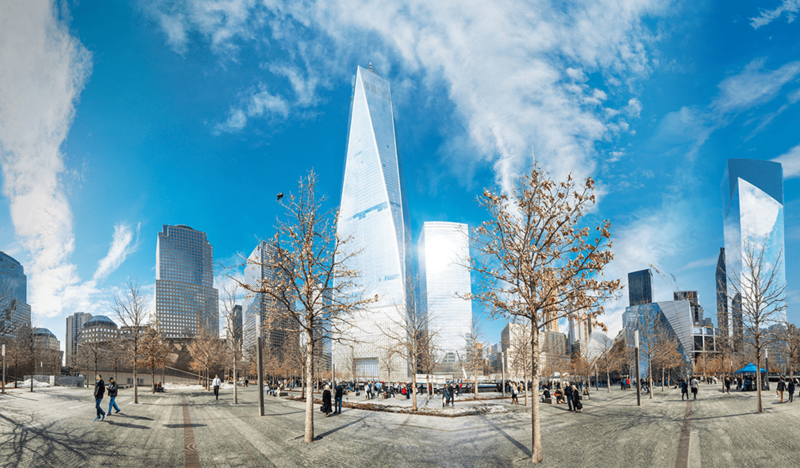 The U.S. real estate market improved in 2012, and there is good reason for optimism going forward as several industries are now contributing positively to the economy. Energy and technology markets are booming again, and the U.S. housing market recovery is gaining momentum. In fact, residential housing has been a positive contributor to GDP growth for four straight quarters. Even the automobile sector is up by nearly double-digit rates due to pent-up demand, providing positive momentum in hard-hit manufacturing cities in the Midwest and South. Employment is expected to return to peak numbers by 2015 in the U.S., and the unemployment rate is expected to reach an “acceptable” 6.5% level by 2016. 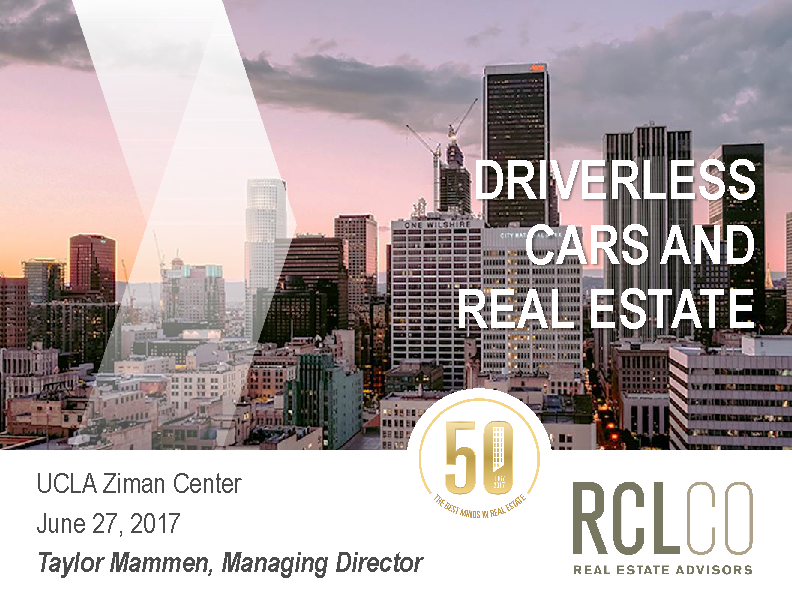 Along the way, the U.S. economy will continue to shift towards service-oriented jobs, which tend to occupy commercial real estate space such as office, retail, and the like. As we predicted last year, the U.S. has been slow to come out of the 2008-2009 recession as the service-based recovery has yet to benefit the nearly five million construction and manufacturing employees still left jobless. 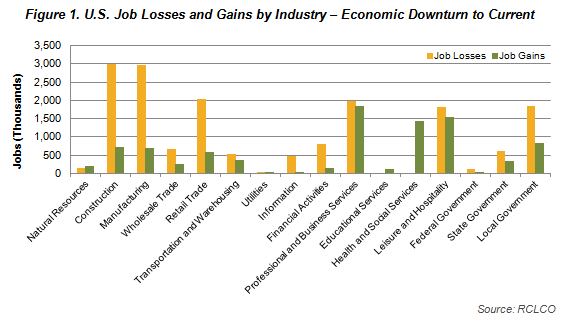 The mismatch between jobs gained since the downturn, which have primarily been in business services and healthcare, and jobs lost, including long-term losses in construction, manufacturing, financial services, and government jobs, will continue to create an unemployment problem as the long-term unemployed are not skilled for the types of jobs that are being created. As we also predicted last year, periodic disruptions to the economy occurred as a result of economic and policy uncertainties. We expect this gradual recovery to continue during 2013 and beyond, gaining momentum and accelerating as time goes by. We also expect the volatility experienced during 2012 to continue, particularly in the first half of 2013, hopefully settling down as some of the current “known unknowns,” such as the U.S. fiscal cliff, are resolved. Secular trends are changing the demographic make-up of the country and its needs for real estate. We expect to see an increase in the migration of aging population bases towards coastal and southern states for warm weather and lower cost of living. 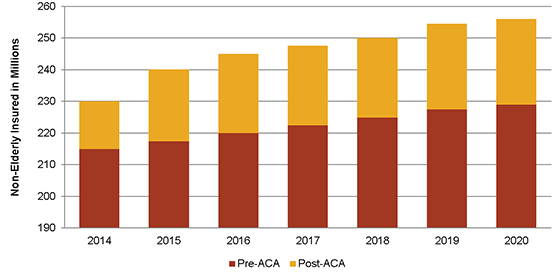 The growing older population, with the oldest of the Baby Boomers now in their mid-60s, will benefit the healthcare segment, as strong demographic tail winds will overshadow the outcome of the current policy debate. Population growth in the U.S. will continue, with in-migration, rather than births, driving growth moving forward. Lastly, the growth of the Hispanic population accounts for the majority of total expected population growth in the U.S., which is likely to create niche opportunities—particularly in housing and retail. There are risks out there. Chief among them are concerns about fiscal and related debt ceiling issues, slowing economies around the world, credit downgrades for the mounting national debt, and so on. Continued concerns about economic growth and the growing national sovereign debt burden contribute to uncertainty about the future and thus to continued volatility in the capital markets in the upcoming year. This could create periods of pricing mismatches between public and private markets—a possible benefit to investors who have both REIT and private market portfolios. While the current accommodative monetary policies are expected to keep interest rates low for the near-term, rates could rise faster than expected at some point. In the property markets, the good news is that cap rates for most property types remain at wider than average spreads to long-term treasuries, providing some cushion against interest rate increases (to a point, of course). While the multifamily sector has been a leader with low vacancy and rising rents, key housing metrics point to the second half of 2012 as the true start of a single-family housing recovery. New single-family home prices, permitting, construction, and sales volume all experienced meaningful increases in the second half of 2012. Further, for-sale housing inventories (months of existing and new home supply, number of distressed assets in inventory, and volume of distressed sales) continued to decline. Meanwhile, the National Association of Home Builders’ Improving Markets Index and Home Builder Confidence Index increased dramatically throughout 2012, and the Case-Shiller index posted a 4.3% year-over-year increase in home prices. There is still significant foreclosure inventory (3.4% of the market), and the number of homes in which the mortgage values remain higher than the properties’ value remains stubbornly high. 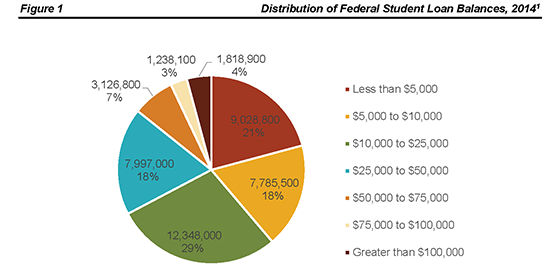 It will take time to work through these issues, and their resolution will continue to drag on the rate of recovery. 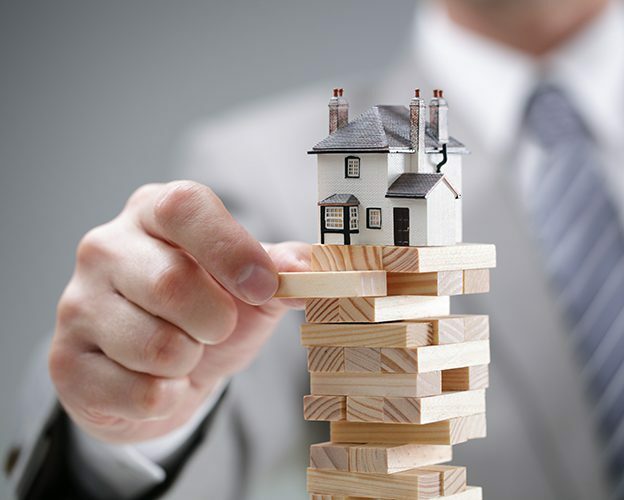 Nonetheless, the recovery seems to be gaining momentum, which momentum can only be aided by the formation of over 20 institutional investment funds targeting single-family properties, helping to clear distressed inventories and thereby removing one of the last main factors dragging home price recovery. 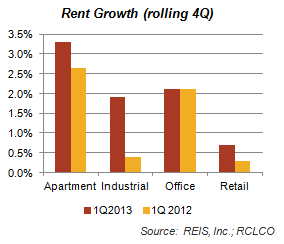 The U.S. office and industrial markets are improving from significant occupancy and rent declines in 2008- 2009. Most regions still have a large recovery ahead to reach more typical occupancy rates, but the overall trends are encouraging, with improving operating fundamentals noticeable in many markets throughout the U.S. 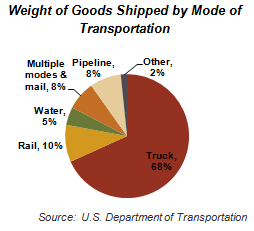 Some secular changes are underway in warehouse usage, which drives niche demand for very large buildings in large markets with good transportation access. Three major trends are important to watch in the warehouse segment—the increasing popularity of extent to which taxes are placed on internet sales, the drive by e-tailers to offer same-day deliveries in major markets, and the integration of robotics in the distribution system. The first trend removes the incentive for e-tailers to locate out-of-state to avoid collecting sales taxes. The second trend creates a need for e-commerce giants like Amazon to locate large warehouses and distribution centers closer to large and dense population clusters as competition heats up to get products to customers faster. The last trend could affect the amount, configuration, and specifications of space needed—robotics could increase the cubic utilization of the space and the speed and accuracy of the sorting, storing, and retrieving of goods, and potentially change the amount of space required to accomplish a given level of logistics throughput. Further, it could affect the employee headcount and skills required, which might have an impact on the economy, as well as on the ability to obtain approvals in certain locales. In the office sector, there are two very different stories. Prime CBD markets are among the few that have relatively low vacancy rates. As rental and occupancy rates have already begun to improve in these markets, property pricing is aggressive, and new construction is starting again. Performance is mixed in most other geographic markets, which generally have higher vacancy rates and are pricing at a large discount to the prime markets. However, as the U.S. economic recovery has been service-based, office employment has been rising faster than overall employment (up by more than 2% in 2011 with another projected 2% in 2012), and more than 4 million new office jobs are expected to be created by 2016, which is good news for low cost and service-based economies, many of which are located in the South. Best opportunities during 2013 are lease-up and sell projects in high-growth secondary markets, and new development in select prime CBD markets. 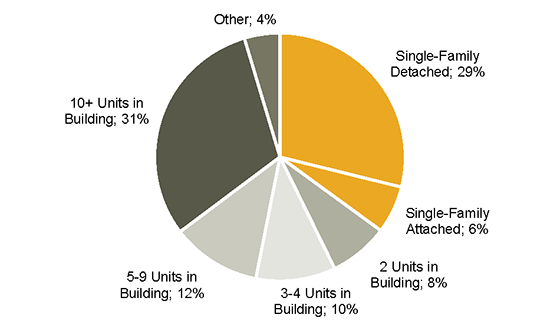 In the longer run, we expect to see continued reductions in the amount of space required per worker, and while a gradual trend, it will have a profound impact on the location, type, quality, and value of office space over time. As a result, careful assessment of the long-term potential for all assets is required to prune portfolios down to the real keepers. The retail sector is also undergoing a gradual yet profound shift. The various levels of retail real estate—from regional malls to lifestyle centers to community and neighborhood centers and on to strip centers—are under attack by e-tailing. As a result, location, concept, and tenancy are the most critical success factors, as more and more retail space is used as experience-oriented showroom/sales floor (think Apple Stores not only for electronics and other hard goods retailers, but also in soft goods categories). At the top of the value chain are the prime regional malls, which have been outperformers given their long-term leases and high-quality tenants. Prices are high for these properties, and deservedly so. While overall retail sales are up, an increasing share of sales are occurring through non-store formats. Clothing retailers in particular are hitting critical levels of internet sales, putting stores in secondary and low-density markets at risk. Top retailers have significant web presences, and are using the internet and social sites to drive store traffic. Discounters, which are still struggling to improve sales, are increasingly moving into food sales, creating competition for grocers. As a result, retailers have been slow to expand store space, with vacancy rates and rents little improved from a year ago. We expect this trend to continue in the coming year, with a likely slow start to the first half of the year and improvement in the second half. In light of these facts, opportunities during 2013 are likely to be niche- based, with a broad recovery in the retail market still a couple of years away. 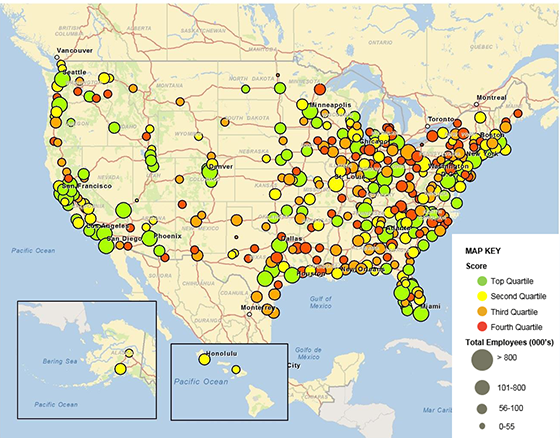 Most attractive opportunities for investment are centers anchored, and/or facilities occupied, by dominant retailers and grocers in high-income, supply-constrained areas, although these properties, similarly to top regional malls, are already aggressively priced. Also, keep an eye out for development opportunities in areas where new housing is developed (or redeveloped)—both “greenfield” and infill development—as retail will always follow the rooftops, as the old adage goes. 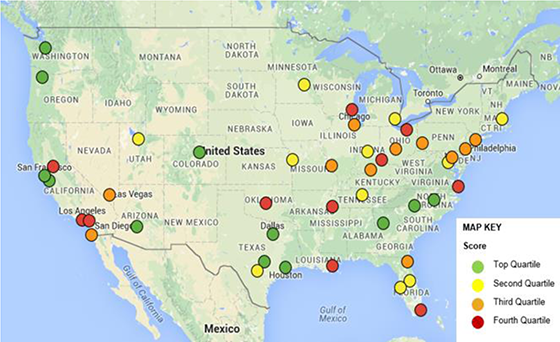 The U.S. hotel market reached bottom in 2009, earlier than the majority of commercial land uses. Key hotel metrics, such as average daily rate, occupancy rates, revenue per available room, and value per room, have improved significantly, particularly for full-service properties in prime markets. Further improvement is expected, particularly for properties in high growth areas. Pricing is still attractive for limited service properties and for hospitality assets in secondary markets, representing select investment opportunities. 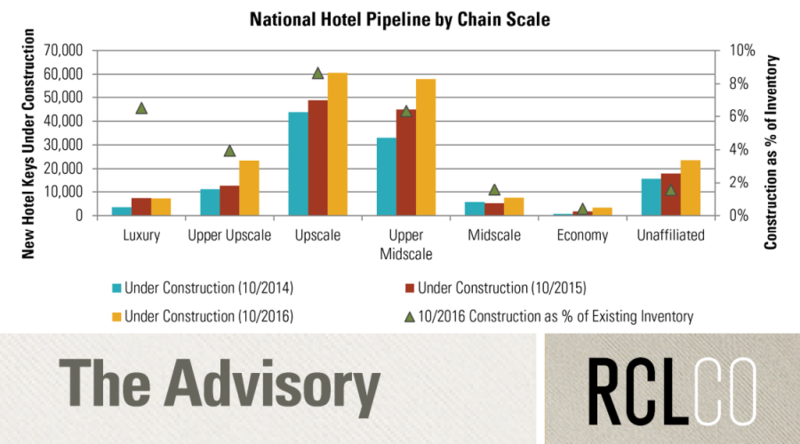 Watch for value-add opportunities as well as stabilized hotel assets in 2013, and for select new hotel development opportunities starting in 2013 and gaining momentum in 2014 and beyond. In the capital raising space, there are signs of life after a long drought. 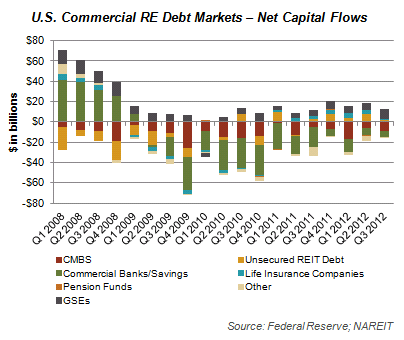 REITs led in capital raising volume in 2012, having raised nearly $67 billion in the first 11 months of 2012 (surpassing both the 2011 and the previous 2006 peak levels), primarily in the form of large secondary and preferred equity offerings. While REIT share price growth slowed in the second half of 2012, dividend yields remained near 3.4%, unchanged from the beginning of the year. 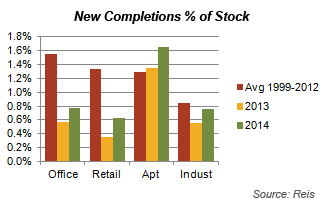 And the CMBS market similarly improved, with nearly $40 billion issued in the first nine months of 2012. Private fundraising is slowly improving, although with just under $50 billion raised in the first 11 months of 2012, total institutional investment fund raising for 2012 is similar to 2009-2011 levels. We expect that the thawing of the capital markets will pick up momentum in 2013, with capital becoming more abundant and less selective. Indeed, there is an abundance of capital chasing real estate investment opportunities, driving property values as well as sales volume up, particularly in the prime CBD office and apartment sectors. In the retail sector, the few prime neighborhood centers and even fewer prime malls that have sold have traded at high prices. 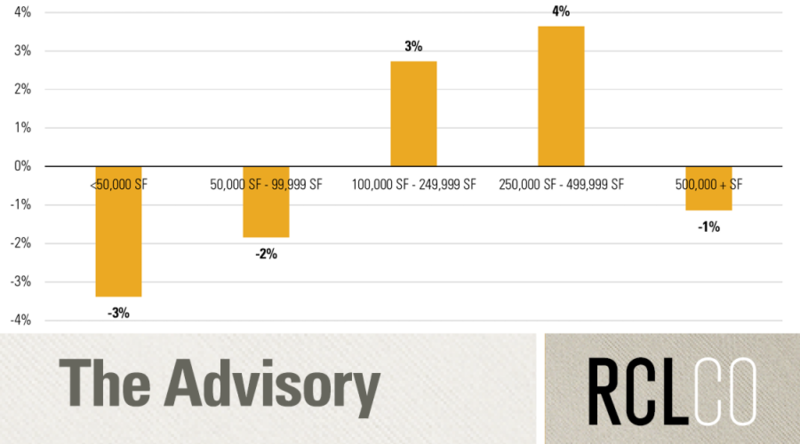 Investors remain risk adverse to the inherent lease-up risk in the industrial and suburban office sectors, which continue to trade at significant discounts to prime CBD office markets. 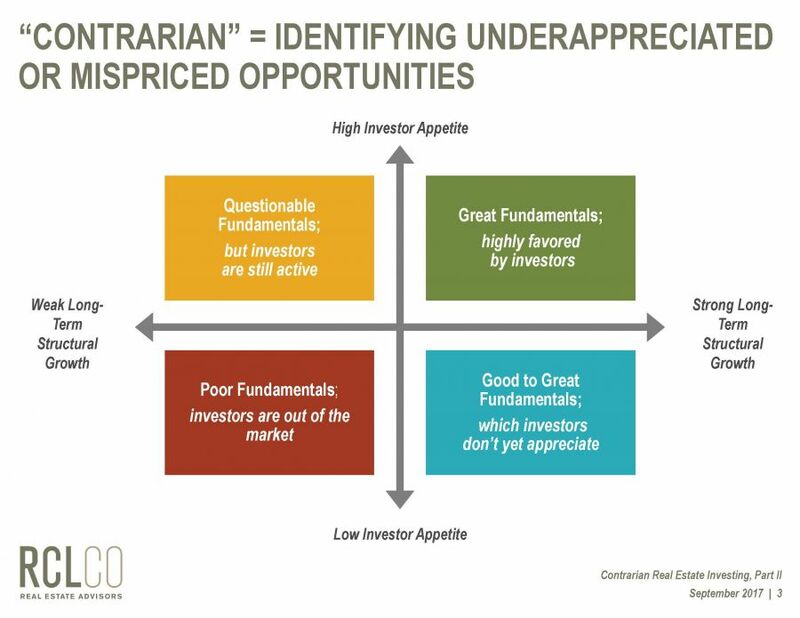 We believe that these latter segments represent significant opportunities for those with an appetite for risk and an eye for value, as operating fundamentals in these categories should improve, particularly in high-growth markets. Overall, we expect real estate values to continue to rise in 2013 with sales volumes following, although the first half of the year could get off to a bumpy start due to uncertainty in the broader capital markets. The New Year starts off dominated by policy issues, which could create confidence and risk aversion that could increase volatility in the market. Our base assumption is that both U.S. and European policy makers will muddle through, keeping both regions in “positive territory,” even if at a slow-growth mode. The downside is that policy fails and, in an environment of low growth and high debt burdens, the developed markets (or at least some portion of them) dip back into a recession. This would in turn create downward pressure on emerging market growth, particularly countries that have a high trade exposure to the U.S. and Europe. While possible, we do not assign very high likelihood to this scenario. On the upside, investors who have cash and some flexibility in mandates could benefit from short-term pricing disparities. Overall, the markets are in an up cycle with positive momentum in demand and little new supply, which is a good environment for new investment. 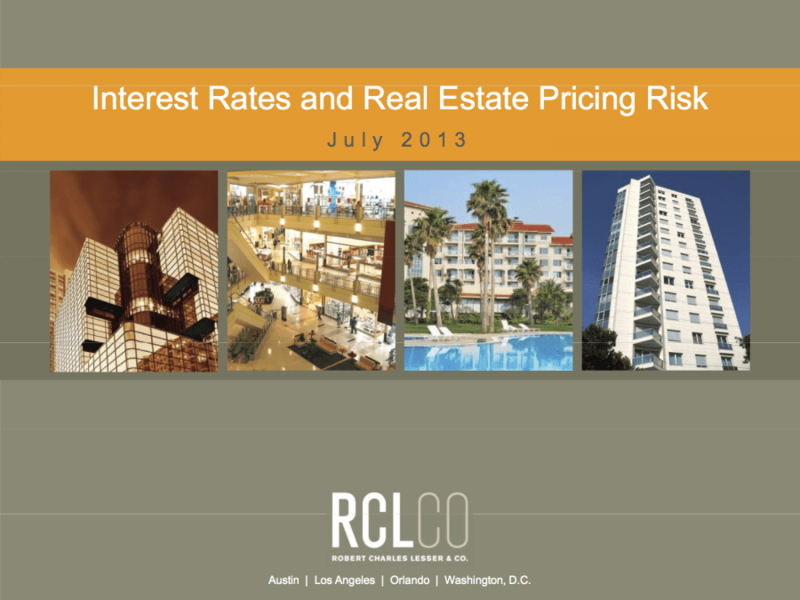 The Fed’s commitment to keep interest rates low for the foreseeable future should be accretive to real estate as compared to other asset classes, although the risks are that investors over-leverage, and that interest rates rise faster than expected, creating downward pressure on real estate prices. Current wide spreads between cap rates and risk-free rates should provide at least a partial cushion to this risk. We will be particularly watching for local opportunities in growth markets that have favorable pricing and are home to skilled jobs in sectors such as energy, technology, and healthcare. The U.S. currently looks favorable on a global scale, where investors remain risk adverse and continue to focus on prime markets, driving yields down to aggressive levels. In contrast to the U.S., many growth markets in other countries continue to experience large construction pipelines which are holding occupancy rates to the same or lower levels. Thus, we expect global capital to continue to focus on the U.S.—which, combined with positive fundamentals, should continue to drive values up, be positive for current owners, and offer increasing levels of development opportunities as vacancies fall and values rise to and above replacement costs.